quick and simple, but also expensive, as you need sketchup pro and 3dmax, right? any “quick and simple” alternative, using SU6 free and open source rendering (kerkythia, blender, etc)? 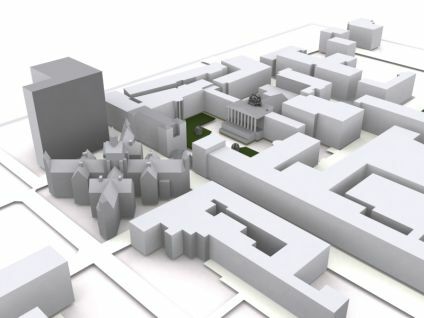 Do you have any more 3D renders of the UCL campus? I would also like to know of any open source 3d packages! unfortunately blender does not play ball with sketchup quite so easily. It’s a real problem. If anyone has a nice workflow for it please post. Well, there is a legitimate (albeit temporary) way around the financial hurdle. After completing a model and generating the scenes/pages you want in Google SketchUp, you can download and install a trial version of SketchUp Pro that will not expire until it is used for eight total hours. Export a 3ds file quickly with Pro, so that you can use SketchUp Pro as an exporter in the future. Then, install the 30 day free version of 3DMax. It’s not the best solution, but it’s something. We’ve experimented with some Sketchup -> Blender using KML as the go between. Skylights are still a little bit of a pain to set up in Blender…but it’s improving every month! We’re excited by the apricot.blender.org project to get improvements to Blender’s real-time game engine which should be helpful to DigitalUrban fans. What part of this looks like clay? If you use SketchUp, why not use one of the render engines for SketchUp such as SUPodium ? (and if you have 3dsmax, why use SketchUp at all) ? – Make sure normals face the right way. – Try to keep faces as ‘quads’ rather than n’gons as SU’s triangulation on export is poor/unpredictable. – Turn ‘view hidden geometry’ on, switch to wireframe view, select all, switch to shaded view and ‘hide’ the still-selected edges. This stops edges as well as faces being exported. – Export KMZ, rename file ext. to ‘.zip’, unzip and locate the .dae file within. – Delete the default object. Use the newest collada importer on the .dae file and check Blender units match scale. Users often let 1 Blender unit = 1 metre. – Select the mesh, go into edit mode, press ‘u’ to UV unwrap the mesh with ‘unwrap (smart projections)’ – the most efficient for buildings/massing models. Here’s where SU’s poor triangulation can lead to inefficient or lower quality UV layouts. – Split the main view panel to show ‘UV/Image Editor’ and create a new image using an OpenlGL friendly size. – Finally… Use the ‘Bake render meshes’ to bake the ambient occlusion to this new image. Tweak AO quality setting as required, saving the resulting UV mapped image. – If the interactive parts from the old ‘walkthrough.blend’ file are used, an interactive runtime file can be produced with gravity, ‘solid’ surfaces, mouse and keyboard controls. That’s where making sure the scale is correct pays off! You could also try the Vray plugin for SU. is there any way to import shape file from google sketch up to landxplorer? is there any way to do so? Its that time of year again and we going to be taking a few days off from blogging. Its been a busy 12 months with the blog reaching over 1000 posts and heading towards 3000 subscribers. As such we would like to take this chance to wish all of our readers a Happy Christmas and a prosperous New Year. Over the holiday period we will be blogging on and off but for at least the next few days its time to kick back, pour a glass or two of wine and enjoy a bit of time out of the city. Happy Christmas from digital urban….